Built during 1960.41 sets each with 4-cars constructed.All off the mainline by 1988.Altogether 16 cars made it into preservation. 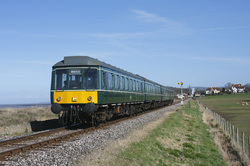 This is a 4-car Class 115. These Units when in BR service ran out of Marylebone going north on the Chiltern Mainline .Here are 51852/59493/59510 and 51859 on the 15:05 service from Bishops-Lydeard to Minehead shortly after it departed from Blue-Anchor.The actual order of these numbers is a complete mystery as none of the identities were displayed on the carriages sides.